The Rosary Chapel, located within Vence, France, was designed by a modern artist named Henri Matisse. 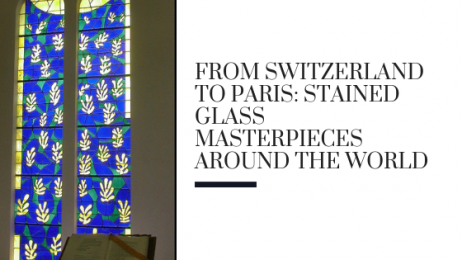 This very unique stained glass collection portrays similarities from Matisse’s famous art serious of cut-outs. With bold colors and forms, these abstract stained glass windows illuminate beautiful prisms when hit by the sun. King’s College Chapel, located in the University of Cambridge’s King’s College, was built in the late 15th to early 16th century. These Gothic stained glass windows showcase some amazing biblical scenery in addition to royal motifs. This stained glass collection illustrates the many artistic advancements that were made in England’s Gothic period. The Nasir al-Mulk Mosque, located in Shiraz, Iran, is often referred to as the Pink Mosque due to the amazing pink glow that’s cast on the interior of the building from the many beautiful stained glass windows. The rose-colored tiles within the mosque are also illuminated. Kansas City Stained Glass would love to help you create the custom stained glass piece of your dreams. No matter what property you’d like to install stained glass in, we can help design the perfect investment. Whether you’d like something inspired from a noteworthy masterpiece or to create something specifically for you, we’ve got you covered. For more information regarding custom stained glass for your Kansas City property, please contact us!